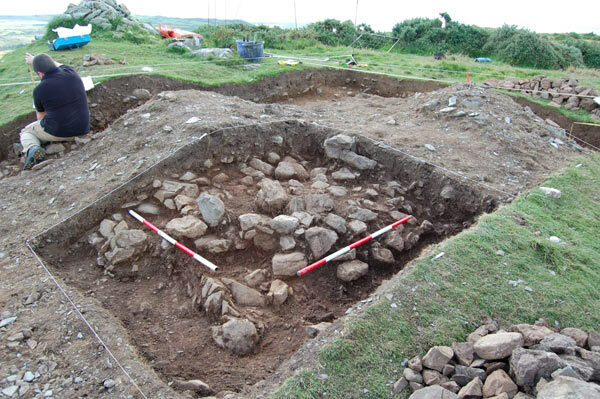 Gwynedd Archaeological Trust has undertaken on behalf of Cadw a wide range of scheduling enhancement assessments, covering prehistoric and medieval periods. Each assessment has involved the examination of all relevant monuments, and the identification of sites of potential national importance which were recommended for scheduling. However, there are inevitably a number of sites, identfiable as earthworks or through aerial photography, which cannot be adequately assessed without further work. The aim of this project is to further assess the significance of specific sites to ensure they match the criteria for scheduling. Five sites were selected from a range of sites which had been identified during prehistoric, Roman and Medieval assessments. Each site was further assessed using appropriate techniques. 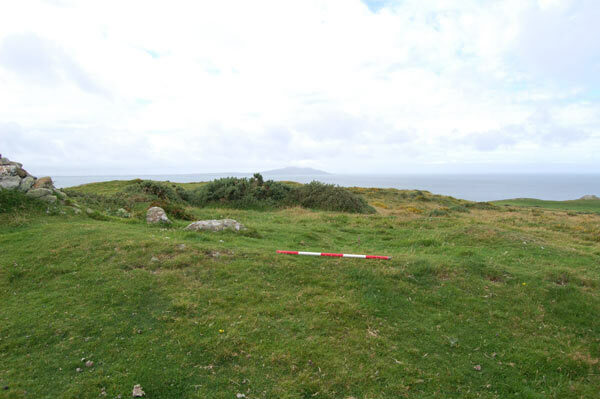 A roughly square platform with dimensions of 7m x 9m, defined by a low bank, stands on the highest point of Carmel Head. It has been traditionally recorded as the site of a chapel but its small size, alignment and remote location suggest otherwise. Local tradition also records that stone was taken from the site to build a new wing on the local church. Following the excavation of a similar structure on Holyhead mountain Peter Crew suggested that it is a Roman watchtower (Crew Arch in Wales 1981). This could either be one of a pair overlooking the entrance to the naval base at Holyhead or part of a string of watchtowers extending around the coast. A quadrant of the site was stripped of turf revealing the corner of a spread bank of stone and earth. An L shaped section was cut through this and the corner was further excavated. Clearance of the bank material revealed a shallow foundation trench on one side and rubble foundations set directly on the bedrock on the other. The corner was also built directly onto bedrock. Three pieces of pottery, almost certainly Roman, were recovered from the tumble. Small pieces of mortar were recovered from the interior of the building but no mortared stone was identified in the rubble. It appears that the local tradition of stone being carried from the site may be correct; the building appears to have been robbed of all useful stone down to its foundations. The poor preservation of the site makes it difficult to draw any definite conclusions about its function but the pottery indicates a Roman date, and its location on the top of Carmel Head would be an obvious choice for a watch tower. Roughly circular earthworks in a small field to the south of Capel Euddog farm are presumed to mark the site of a former chapel. The field containing the earthwork, about 0.75 ha, was surveyed at high resolution. The survey revealed a series of overlapping anomalies, presumably representing several phases of activity. Of particular interest is a rectangular negative anomaly with dimensions of 11m x 5m aligned a few degrees off E-W. Negative anomalies usually indicate substantial amounts of stone so it is likely that this indicates the presence of stone foundations. The western end could be apsidal but the results are not clear in this area. The feature is visible as a low earthwork in the field. A fragmentary, roughly circular earthwork can also be seen but this did not produce a geophysical anomaly. Several linear anomalies could indicate a later enclosure. The survey adds considerable weight to the hypothesis that this is the site of an early chapel. The site of Dygwel Chapel is identified by RCAHMW as being at the north end of an existing field. A deviation in the field boundary appears to define one edge of the graveyard. The field containing the earthwork was surveyed at high resolution. The survey was dominated by highly magnetic bedrock and no archaeological anomalies could be identified. The survey identified a wide range of features. 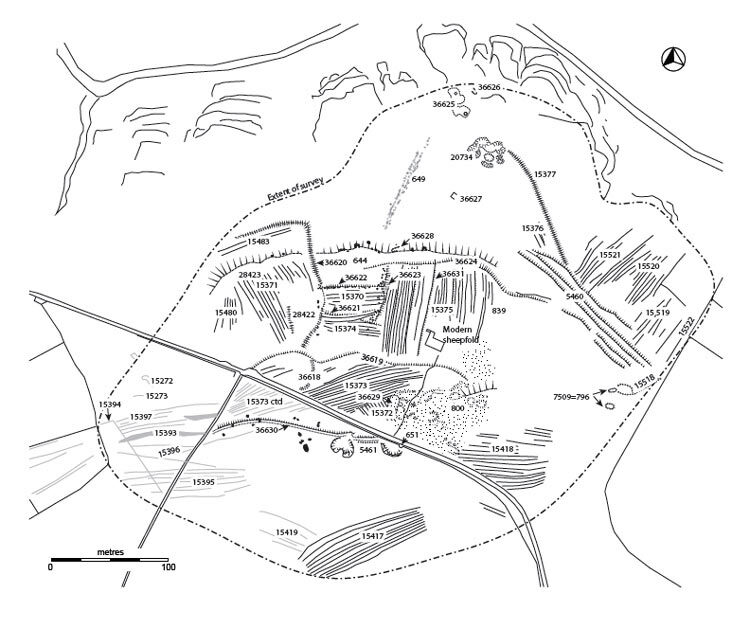 The most significant are the extensive field systems originating in the medieval period and probably associated with the township of Cyngreawdr. There are two long-huts and several phases of cultivation ridges. Some of the earliest may be traditional ridge and furrow but there seems to be a seems be a progressive use of ever more marginal land. The earlier fields are on relatively level ground whereas the later fields are smaller and required more terracing. Some cultivation terraces are on a very steeply sloping land and must have required a large amount of effort for relatively little gain. The smaller enclosures and terraces would have been too small or too steep to plough and were almost certainly spade-dug. 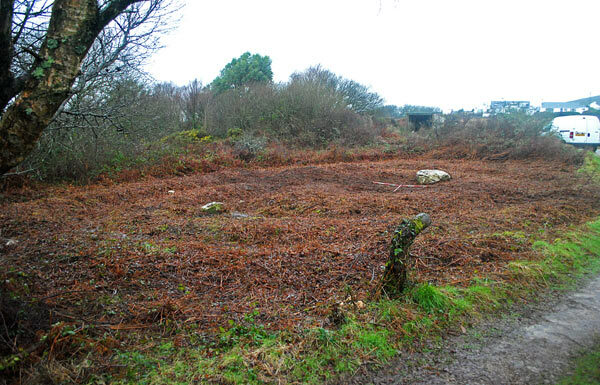 The double stone row that gives the area its name (Hwylfa'r Ceirw, path of the deer) has not been dated and no entirely convincing interpretation has been put forward. It is clearly early enough to pass into local folklore and may be prehistoric although its resemblance to well-known examples of stone alignments on Dartmoor and elsewhere is somewhat tenuous. Alternative explanations, and indeed its name, are mostly based on a function as a marked pathway, leading to a natural route down to the lower levels of the Orme and the coast. Its style of construction resembles the orthostatic walls to the south (36622), that are probably medieval or later. An ore-processing site at the north has been somewhat disturbed but still represents a large area of activity but is difficult to interpret. There are a wide range of features, including a regular rectangular feature at the west (36629) and a range of linear and sub-circular banks and hollows elsewhere. Previous work suggests several phases of a activity from the Bronze Age up to the 19th century. The site comprises a series of three “pear-shaped” concentric banks with an overall diameter of 65m. It is clearly of some antiquity but is not understood. Basic and simplified plans were produced by RCAHM and the OS . According to the Ordnance Survey, the earthwork is traditionally the site of an open-air chapel. The Royal Commission records it as an unclassified earthwork and the description in Arch Camb 1924 ends with the enigmatic statement “What might this earthwork be..”. The site was very heavily overgrown with 1.5m high, bracken, brambles and blackthorn. This was cleared using a brush-cutter and handsaw. The area was then surveyed using a Trimble high resolution GPS system and a hand-dug 1m wide trench was cut through the three banks on the south western side of the site. A new plan was produced. 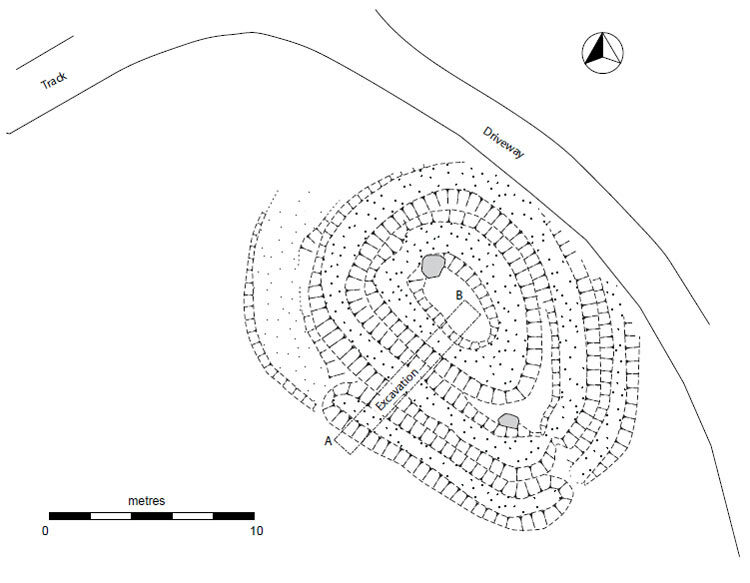 The site comprises three concentric banks. All are roughly pear-shaped in plan, almost flat-topped and about 1.3m wide. The outer has dimensions of 11m x 8m (from the edge of the bottom of the bank) although this has been truncated by 1 to 1.5m on the north-eastern side by the driveway. The inner has a large stone with dimensions of about 1.2m x 1.0m set into, and standing above, the height of the bank. The banks at the south-eastern side of the site, i.e. the pointed end of the pear-shape, have a low point and the ditch between them is wider. This could be interpreted as an entrance or possibly a drain. A 1m wide trench was excavated through the earthworks on the south-western side of the site. They were found to be simple banks of earth and stone. The only finds from the site dated from the late 19th/ early 20th century. It is an unusual site; there are no obvious parallels in north Wales. It appears to be too sharply defined to be prehistoric; the ditches would almost certainly have silted up if the site was of great antiquity. An open air preaching site as suggested by the tradition recorded by the OS would make sense morphologically. The large stone could be seen as the focus of the site with the highest banks arrayed in front of it. This could date from one of the Methodist revivals of 1750, 1859 or 1904-5. There is, however, no local knowledge of the site and there are some doubts about the reliability of the ‘traditional' evidence recorded by the OS. No records of the site were found in Gwynedd Archives and despite liaison with several eminent local historians no documentary evidence has emerged.